Hello guys! Or should we say “Shalom!”? Yes, it is that time of the year again when festivities are in full-swing for the Jewish community. Hanukkah, a Jewish festival, is right around the corner. 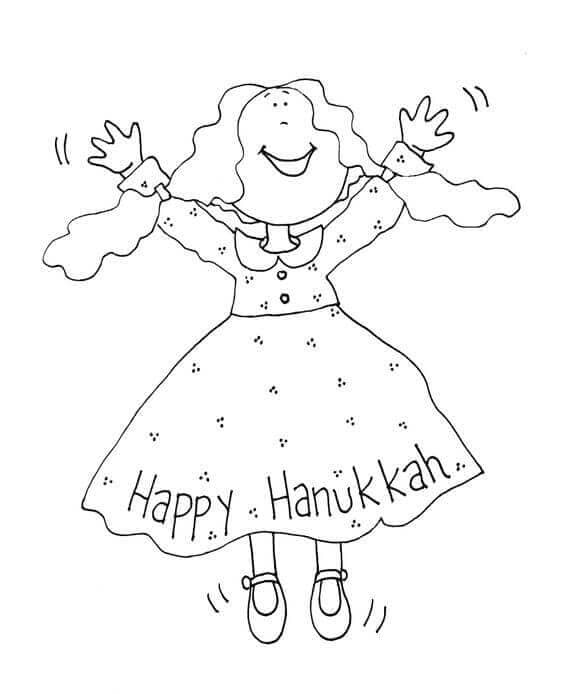 And we are here with a jubilant collection of free printable Hanukkah coloring pages specially dedicated to this long festival lasting eight nights and eight days. 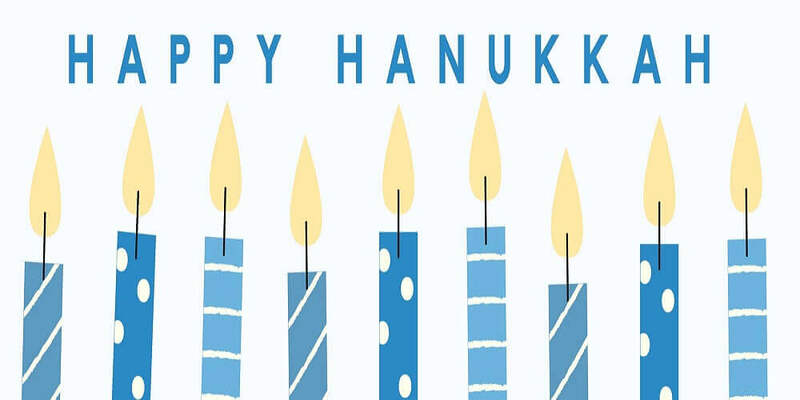 Hanukkah, also spelled as Chanukkah, is celebrated to mark the occasion of the successful recapturing and rededication of the Second Temple in Jerusalem. The temple had been desecrated during the Seleucid Empire. 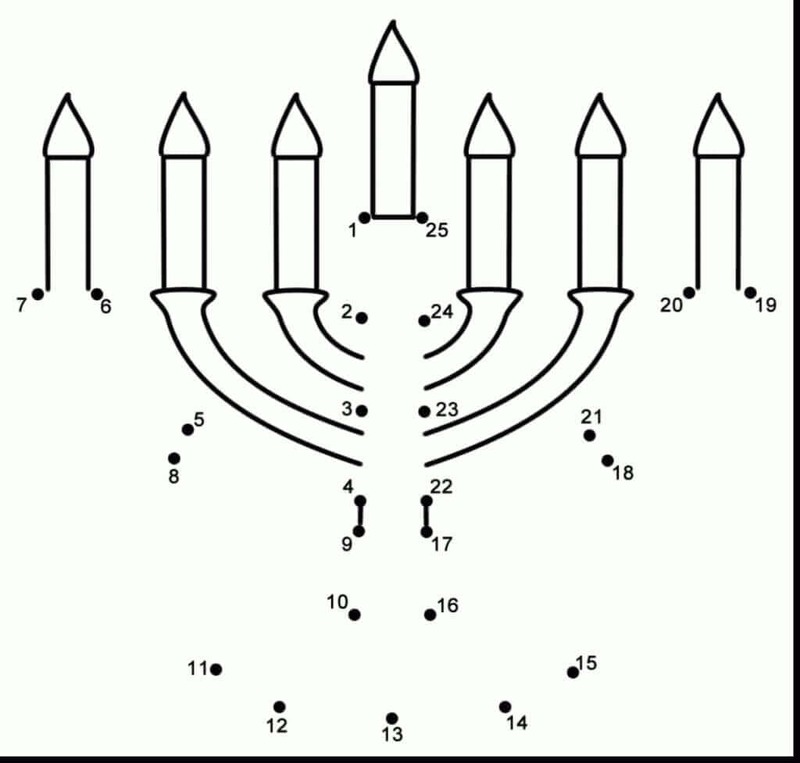 Hanukkah occurs on the 25th day of Kislev based on the Hebrew calendar, usually falling between late November to late December in the Gregorian calendar. 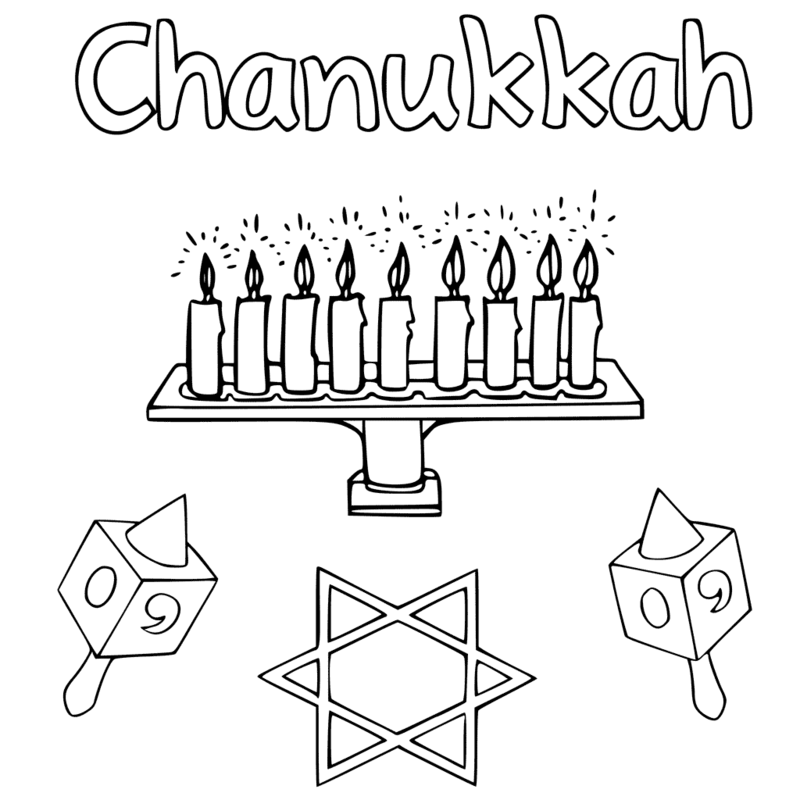 Let’s now dive in deeper and learn more about Hanukkah and how it is celebrated through these Hanukkah coloring sheets to print. Hanukkah is also called as the Festival of Lights. You can see this little boy lighting the menorah, a nine-branched candelabra as part of the ritual. Each night a candle is lit till all candles are lighted by the eighth and final night. Lend your joyous colors to fill the illustration on this coloring page. Looks like our friendly foes, the famous cat and mouse duo, Disney’s Tom and Jerry are here to witness the lighting ceremony tonight. They seem to have forgotten about their long-standing fights and lost in admiration of the Hanukkah lights. Rejoice in this wonderful illustration by printing and coloring this page. The little chicks are so happy to see their parent bird come back with food. But wait a minute. That’s not food. That’s a dreidel. How sad! The bird mistook the dreidel, the spinning top having four sides with a circular base and pointed tip, as a piece of food. You can print this page and unlike the bird, remember not to make any mistakes and color the illustration correctly. Playing the dreidel is a customary practice during Hanukkah. Children are encouraged to spin the dreidel, known as sevivon in Hebrew, after the candle lighting ceremony. You can see the joy of these boys, having such a pleasantly playful time, spinning the dreidels. Print this page and have a great time coloring it. As part of the festivities, daily prayers have special additions and a total of three blessings, third one added on the first night, are recited each night while lighting the candles. The lights of this menorah are looking so bright here! Print and give this page your warm coloring touch. Another name for Hanukkah is the Feast of Dedication. As an ode to the miraculous burning of holy oil, lasting for eight days, after rededication of the Second Temple. That’s the reason why this beautiful family here is gathered with all these fried food after lighting the candles. Print this page and anticipate the delicious treats you will get to eat after you are done the coloring. Hanukkah is more of a celebratory festival and unlike on the Sabbath, it has no obligation to refrain from any specific activities. It is, in other words, a time to rejoice in the blessings and being grateful for the miracle of life. It looks like a reveling time for the family here on this illustration. Be sure to print and color this page with equally elated colors. Spreading the joys of the Hanukkah festivities is this reindeer here. 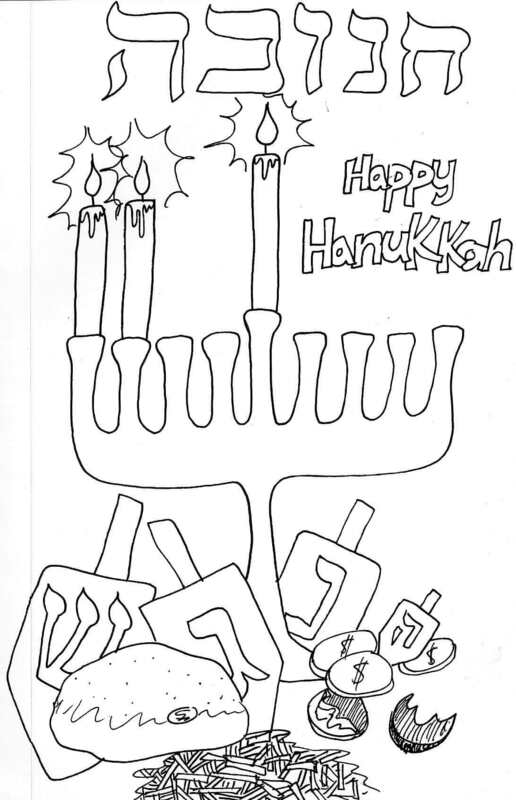 Holding the “Happy Hanukkah” sign, this funny illustration has made clever use of the antlers of the reindeer as a menorah. 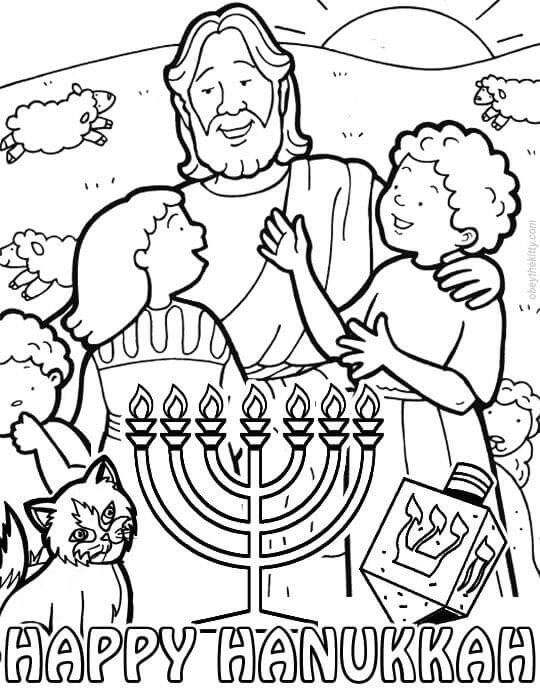 You are sure to have a laughing riot of a time coloring this page. Our grandparents are the best storytellers in the world. Wouldn’t you agree? The joy in the face of the old grandpa on this page is equaled only by the wonder on the little boy’s face. He is narrating about the origin of the Hanukkah festival. How Antiochos IV of the Seleucid Empire had looted the temple, outlawed Judaism and massacred Jews. This led to the formation of the Maccabees, a rebel group of Jews to fight against the Empire. Mattathias, the Head Priest, and his five sons were the first to wage the rebellion. Print this page and help build the atmosphere of the storytelling session through your colors. Hanukkah festival is a time for family and celebration. Lighting of the candle is followed by games which the children are encouraged to play. 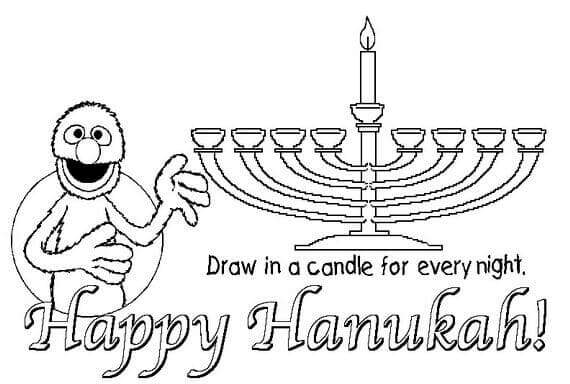 You can print this page and every night after the lighting ceremony, add and color a candle in the illustration. 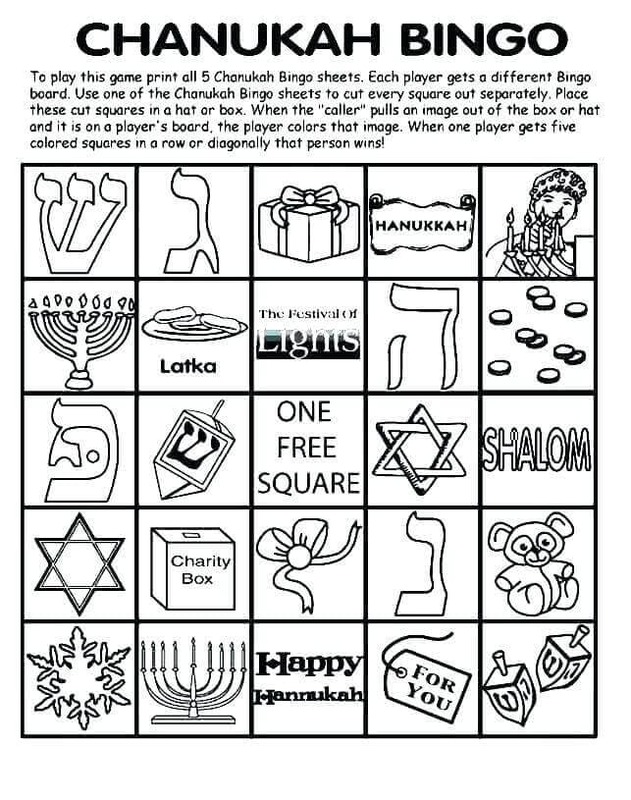 Speaking of games that you can play during Hanukkah, here is a bingo game inspired by the festival. 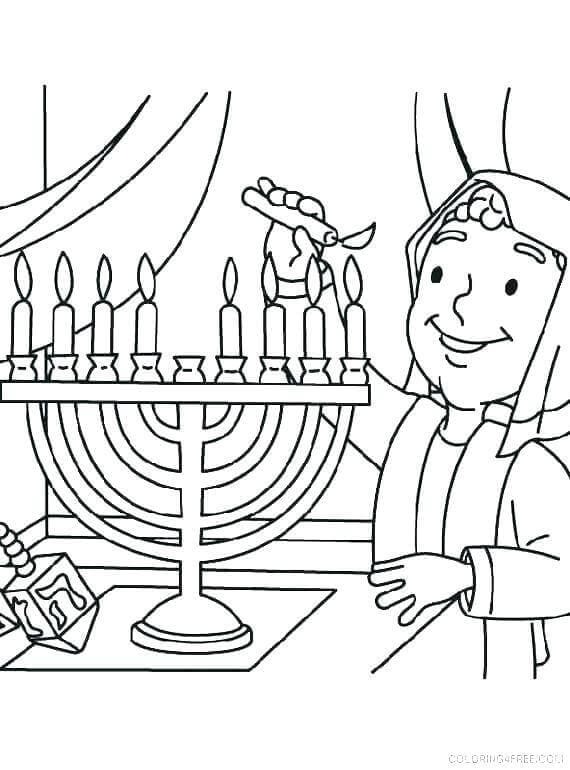 You can print a set of this coloring page, use them as instructed to enjoy an entertaining game of bingo every night of Hanukkah. Because of the miracle of the holy oil, an assortment of fried foods is eaten during the festival. Can you see those bowls and plates full of sumptuous food? Famous among them are latkes or potato pancakes and sufganiyot or jelly doughnuts. Print and carefully color this page showcasing the little boy filling his tummy with delicious fried food. Here’s an illustration that needs your help for its completion. All you need to do is take a printout and simply follow the numbers in ascending order to connect the dots. Color them in brilliant colors to illuminate this precious menorah. Among the games played is spinning the dreidel. In this detailed illustration, you can clearly see the proper shape of the dreidel. There are four sides, each with inscriptions of a Hebrew letter forming the acronym for Hebrew words “Nes Gadol Haya Sham” meaning “A great miracle happened there”. The inscription is in reference to the pure holy oil lasting for eight days. Add detailed colors to this dreidel and spin it to life. A picture can speak a thousand words, they say. 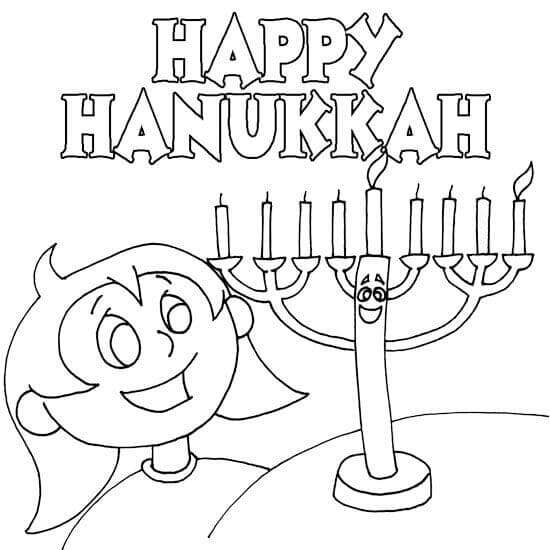 With this single illustration on this coloring page, you can get all the ideas of what the Hanukkah festival is all about. From the menorah to the dreidels, from the delectable fried foods to the Hanukkah gelts or money which are distributed to the children. Take a printout of this Hanukkah essentials illustration and fill it with all the essential colors it needs. Hanukkah activities begin once the lighting ceremony is completed in the evening. 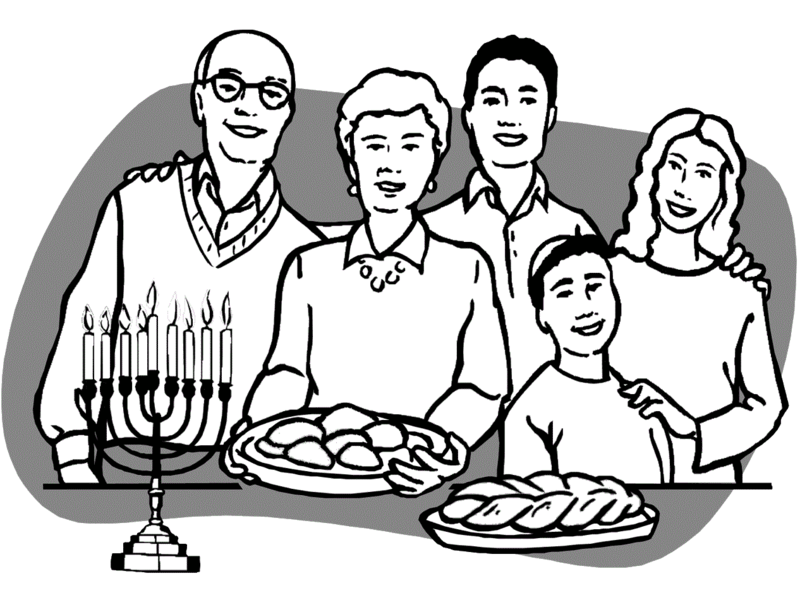 Aside from the eating of fried food and playing of dreidels, most families also exchange gifts each night. Can you see the beautifully wrapped presents on the table along with the other items on this illustration? Print this page and present this illustration with bright colors. 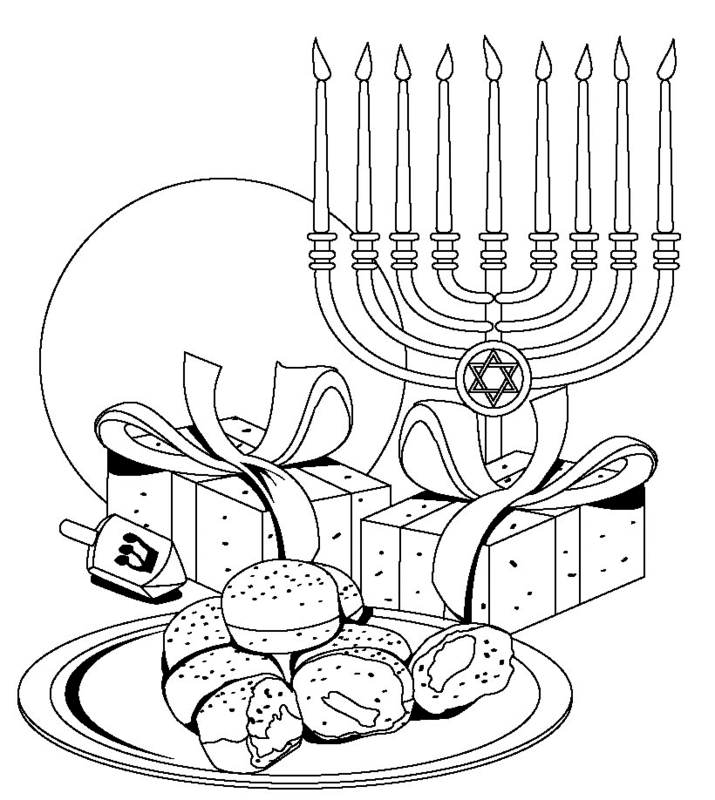 Giving you the festive ambiance is this illustration on the coloring page, with its crafty use of the letters in Hanukkah as the lights. 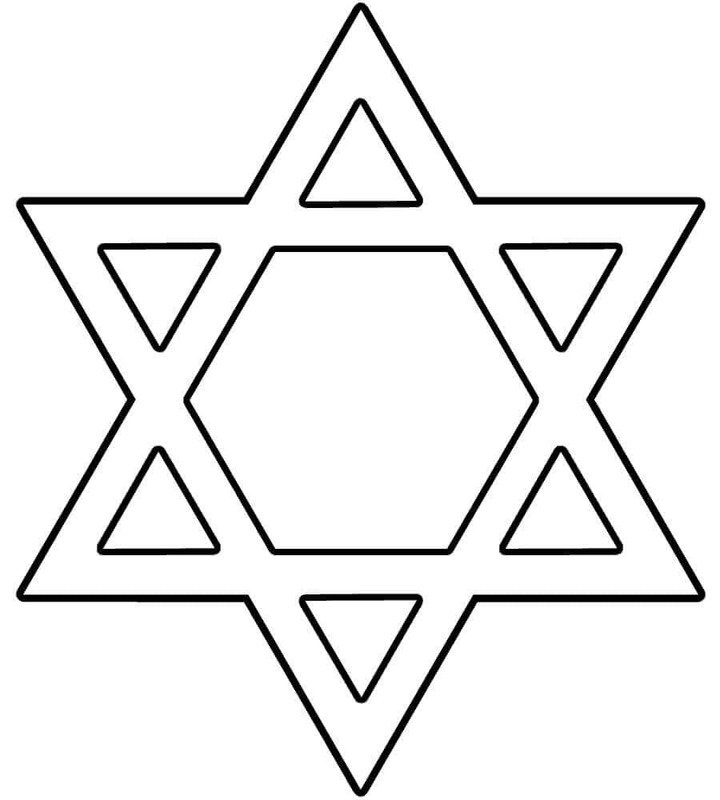 The Star of David which has come to be known as a symbolic representation of Judaism and the Jewish community. You can print this page and partake in the festivity by coloring it with joy. After lighting the candles this little bunny is already enjoying the fun games and activities. Make his time even more special by printing this page and adding a splash of color to his celebration. This aesthetically designed scroll represents the traditional element of the festival. The well-crafted design will need your expert coloring skills. Print this page and bring out the details in lively colors. When the holy menorah was lit to celebrate the rededication of the temple, there was only enough sealed pure olive oil for a day. 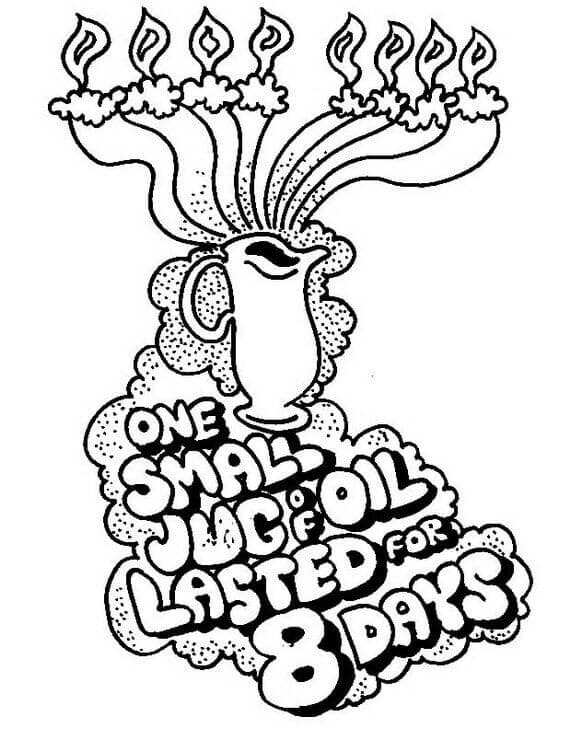 Miraculously it lasted for eight days, the time it took for new oil to be made. Hanukkah is observed for eight nights and days to commemorate this miracle. Illustrating this beautifully is this coloring page which you can print and color. You can see how a new family member is introduced to the Hanukkah rituals regarding the lighting of the menorah, also referred to as Hanukkiah. Take a printout of this coloring page and learn about the process of the ceremony like how the candles are lit, through this illustration, as you give color to it. Did you know that the Jewish day begins at sunset? That is why the festival begins with the lighting of the candle at sunset on the first day. Look at the little girl admiring the light on the first evening. She is excited about the beginning of one of her favorite festivals. Join in to celebrate with her by printing this page and coloring it. During the festivals, the adherents work as usual but may leave early so that they are home in time to kindle the lights at sunset. 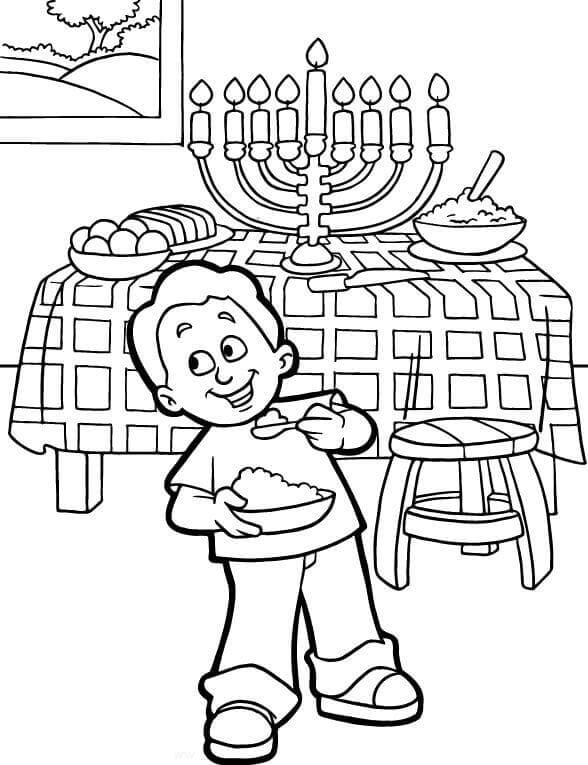 On this coloring page, you can see an artist working on a Hanukkah theme painting. All she needs are some colors. Print this page and fill it artistically with your colors. Schools tend to remain open but in Israel, they are closed from the second day onwards. Perhaps that is the reason why this little girl is jumping with extra joy. Even her ponytails are flying in the air. Capture this elated illustration by printing and coloring this page. One of the candles or light called the Shamash is used to light the other eight candles; one candle each night until all are lit on the last night of the holiday. You can see it as the central branch of the candelabra in this illustration. 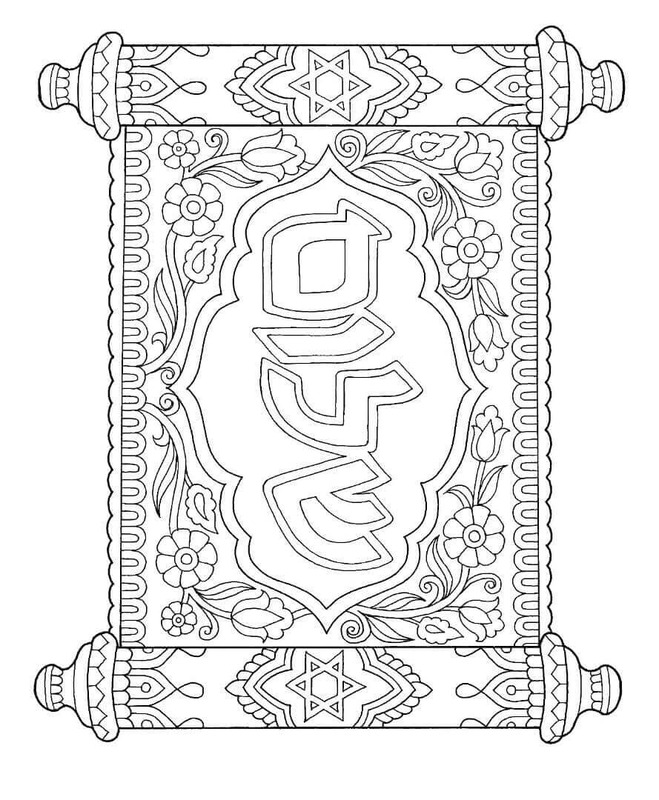 The menorah on this coloring page also has the Shamash in the central branch. Shamash meaning the attendant is usually the branch above or below the other branches of the candelabrum. 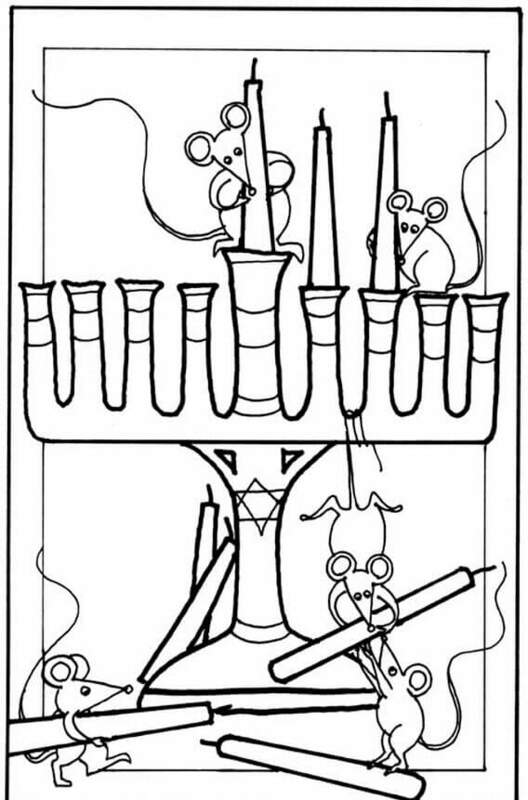 You can take a printout of this coloring page and brighten up this menorah with your colors. Hanukkah generally falls around the end of the year during the holiday season. With its reindeer and bearded old Jew man, this illustration ingeniously combines the Christmas spirit with the Hanukkah festivities. Make sure to print and color this page in a festive mood as well. Like the little mice helping with cooking in a restaurant in the movie Ratatouille, here they are busy setting up the candelabra for Hanukkah. Take a printout of this coloring page and have a grand time coloring this elaborate scene. The Star of David, also known as Magen David meaning Shield of David in Hebrew is recognized as the symbol of Judaism and Jewish identity. It is a hexagram with equilateral triangles. You can take a printout of this page and solemnly color it. 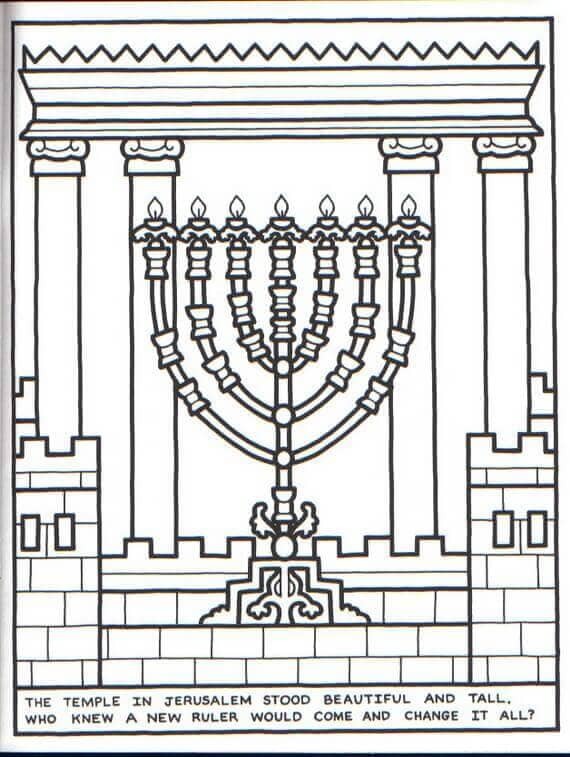 The artistry in the synagogue and the expertly crafted menorah in this coloring page is awe-inspiring. You can work the same magic with your colors, by printing this page and coloring every minute detail. 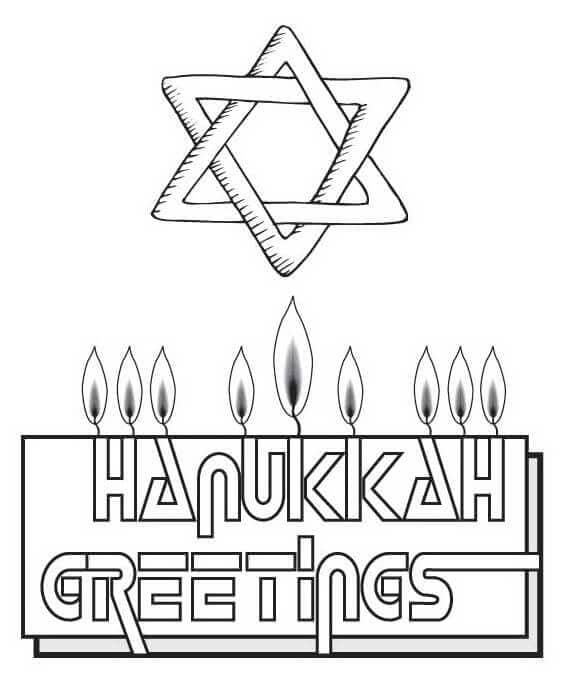 Hope you had an entertaining and informative time going through this collection of Hanukkah inspired coloring images to print. Learning about the history and customary practices of a festival gives us an insight into the world of different cultures and traditions. At the same time, it also highlights how in festivities we all share the common emotion of joy and happiness. 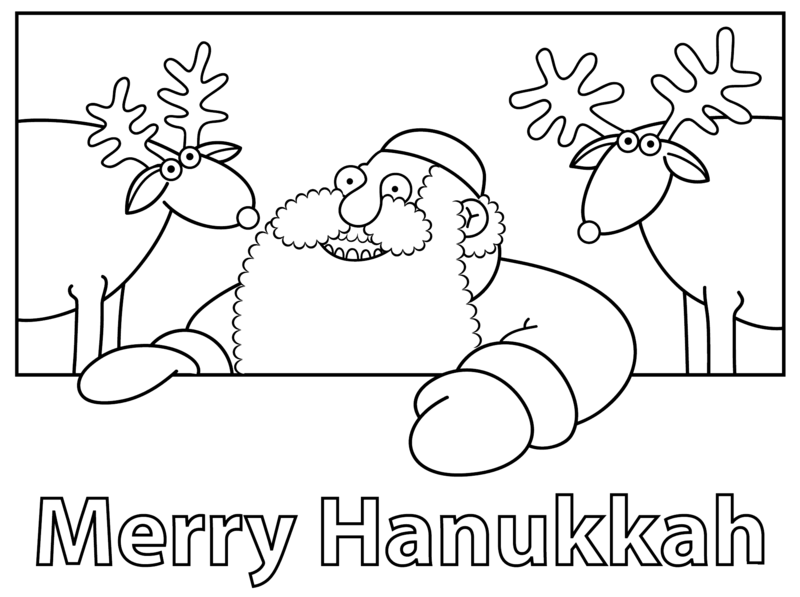 You can begin your happy holiday season by printing and coloring these Hanukkah coloring pictures printable.